Security vulnerabilities are uncovered on a daily basis, and managing the security patches that address them can be an endless and often complicated task for every network administrator. 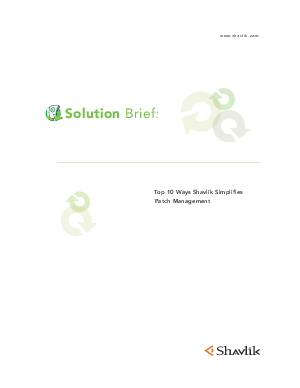 Without the right automated solutions, patch management can be a tedious and herculean task, requiring companies to regularly devote hundreds or even thousands of man-hours. Furthermore, deploying an untested or incorrect patch, or failing to patch key business assets can result in serious consequences for the organization. Fortunately, Shavlik Technologies takes the sting out of the patch management process, while at the same time accelerating and continuously improving security and compliance readiness. Our industry leading solutions simplify even the most complicated patch management tasks so network administrators can get their life back and corporate executives can sleep well at night.